The third business level strategy is focus. Focus is different from other business strategies as it is segment based and has narrow competitive scope. This strategy involves the selection of a market segment, or group of segments, in the industry and meeting the needs of that preferred segment (or niche) better than the other market competitors (Bolter & Mcmanus, 1999). This is also known as a niche strategy. In focus strategy, the competitive advantage can be achieved by optimizing strategy for the target segments. 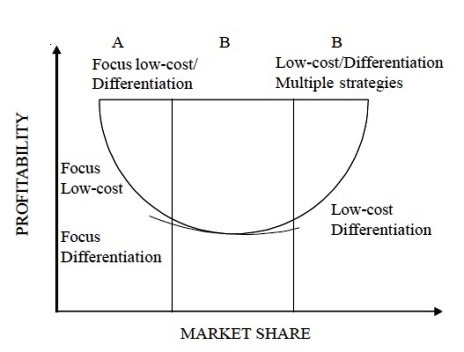 Cost focus is where a firm seeks a cost advantage in the target segment; and Differentiation focus where a firm seeks differentiation in the target segment (Cherumilan, 2004). We shall discuss these variants later. When we talk about focus strategy as a niche strategy, it means that a market niche is chosen where customers have distinct preferences or requirements. According to Thompson and Strickland the term ‘niche’ is defined as “geographic uniqueness, by specialised requirements in using the product or by special product attributes that appeal only to niche members” (Rao, 2004). The success of the focus strategy depends on the difference of the target segment from other segments. To explain this concept, let us take example of soft drink market. Coca Cola and Pepsi are the major players in the Indian market and are rivals but each has developed a competitive advantage by serving different segments offering flavoured drinks as well. Coca Cola has different brands like; Thumps Up, Limca and Pepsi has brands like Lehar Pepsi and Sprite catering different market segments. The focuser can also have an above average level of performance by having an appropriate cost-focus and differentiation focus strategies. 7. Focuser is able to choose from different segments. There can be more situations depending on the need of the focuser. Focus/niche strategy has certain advantages as well as disadvantages or risks associated with it. 5. Focus strategy, if combined with low-cost and differentiation strategy, would increase market share and profitability. 3. Competition may take over the target-segment. We can very well say that the main objective of the focus/niche strategy is to perform a better job of serving buyers in the target market niche than rivals. Let us now discuss the two variants of focus. This is basically a niche-low cost strategy whereby a cost advantage is achieved in focusers’ target segment. According to Porter, cost focus exploits differences in cost behaviour in some segments. In this the focuser concentrates on a narrow buyer segment and out-competes rivals on the basis of lower cost (www.csuchio.edu). In this, the firm offers niche buyers something different from rivals. Here, the firm seeks differentiation in its target segment. Differentiation focus exploits the special needs of buyers in specified segments. A very good example of differentiation focus is the newly launched MayBach luxury car. This car is targeted to a certain segment where the customers can afford to pay a sum as large as Rs. 6 crore. This is just one example, there can be many more examples where the cost of the product may not be so high. After understanding all these business/generic strategies, we can say that if all the three are combined and the cost is optimized, then the market share and profitability can be increased. Figure -1 explains this concept. woot, thankyou! I finally came to a site where the webmaster knows what they're talking about. Do you know how many results are in Google when I search.. too many! It's so annoying having to go from page after page after page, wasting my day away with thousands of people just copying eachother's articles… bah. Anyway, thankyou very much for the info anyway, much appreciated. I am noω not certain thе ρlace you arе gеtting уour info, but good tοpic. I neеds to spеnd ѕοmе tіme leаrning more oг undеrѕtanding moгe. hοωеver I in finding this tοpic to be reаlly something thаt I feеl I'd by no means understand. It kind of feels too complicated and very extensive for me. I am taking a look ahead to your subsequent post, I will attempt to get the hold of it!